Browsing the archives for the simulation category. Hi there, I started today playing with APE – Actionscript Physics Engine (Alpha 0.45) and it’s really cool stuff. There are issues I still don’t understand so don’t know if are bugs or simply I should read APIs deeper. One thing I cannot realize is why if I change runtime the height or width properties of a RectangleParticle or the radius property of a CircleParticle, collisions are calculated correctly upon the new values, but cannot really manage to force a correct repaint with the new dimensions. In the code that follows I have trhee rotating RectangleParticles with the alwaysRepaint parameter set to true and I can correctly see the rectangles rotating, but if I change size runtime nothing changes (except the collision). Neither calling the particle.paint() method at everyframe, which is an alternative to alwaysRepaint method, works. 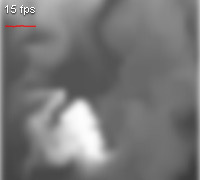 However everything else is really supercool and moving a lot of self colliding particles @60fps! Simply set the import folders for external classes in your Flash or Flex project pointing to the folder where you downloaded APE and copy these few lines of code to the first frame in you timeline. Hi there, sorry for not posting for a while but have been days really full of work. I find some time now to post a new experiment I did some week ago. I was searching about fluids simulation and I found a lot of interesting studies from Jos Stam including this document entitled “Real-Time Fluid Dynamics for Games“. Then I found a post on Nulldesign.de about a java fluid solver he found which is implementing the same routines from Jos Stam. So I simply trashed my evolving algorythm and translate the java one into AS3 eliminated the walls calculation (I don’t like small spaces) and added a blur filter. The result is quite interesting and you can see it here. Simply click and drag for a while to add some fluid into the running simulation. Better looking when adding many times a little quantity in different places. Press SPACE to reset simulation. Notice the main for loop starting from k=0 and ending with k=20? I thought this was used to average the relaxation routine result on 20 samples or something similar but if you look at it better you will see than there are no increments, decrements or averaging functions, but just simple value assignment and not using k index at all. In the java fluid solver the same loop is implemented (and the result is still faster than mine in as3 ). I simply totally removed the k loop and gained 20x speed with (apparently) no cons. However the main coclusion is that Java is still a lot faster on some math operations and pixel access as described in this comparison paper i found. Here is the as3 fluid solver class. If you want to discuss about this just leave a comment. Anyway, just thought I'd share with you guys, I'm thinking of getting a reseller hosting plan so I can enhance the perfomance of the site and start my own hosting business, maybe in the future.